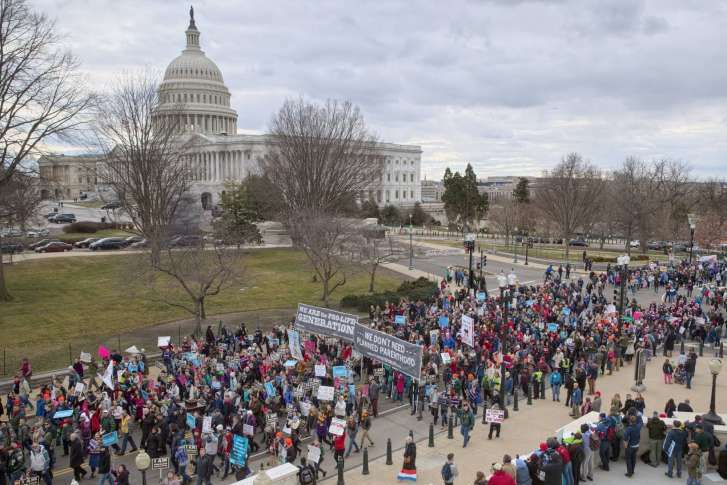 WASHINGTON — If you’re thinking about going to Friday’s March for Life on the National Mall, here’s what you need to know about getting there and getting around. It starts with a rally at noon on Friday, Jan. 18. Here’s the map of the route from the organizers. What about the government shutdown? It won’t affect the march. “Permits allowing events to take place will be issued for First Amendment demonstrations on the National Mall whose applications were submitted prior to the lapse of appropriations,” National Park Service spokesman Mike Litterst told WTOP. Organizers recommend taking Metro. The three closest stops are Federal Triangle and Smithsonian (on the Orange, Silver and Blue lines), and Metro Center (on all those lines plus the Red Line). Metro runs on SmarTrip cards, which you can (and should) load up at machines in the stations before your trip. Let people get off the train before you get on. That said, be quick about getting on. If you’re waiting for a train and see most people congregated at one spot on the platform, head for a less-populated spot — spread the crowd out a bit. Know that Metro doors are not like elevator doors — don’t stick your hand or foot out at a closing door thinking it’s going to spring open. It won’t. There is no eating, drinking or smoking on Metro. If you want to stand on the escalators, stand to the right. Leave the left side to people who are walking down. Changing trains is the real time-killer. If you have the choice, get as close as you can get on one train and then walk. Here’s Metro’s map of their system. F Street Northwest from 6th Street to 7th Street, outside the Capital One Arena, will be closed for the opening musical performance by the Sidewalk Prophets from 6 a.m. to about noon. And 7th Street from F Street to Jefferson Drive Southwest will be closed from 10 a.m. to about noon. Firearms, explosives and weapons; pepper spray and large bags aren’t allowed on the National Mall. Signs can’t be higher than 12 feet. If you’re headed to the grounds of the Capitol or the Supreme Court, you also can’t take bags bigger than 18 inches wide by 14 inches high by 8.5 inches deep; also aerosol containers, food and drink, or sealed envelopes and packages. If I can’t make it, can I watch on a live stream? Yes. The organizers say they’ll stream it on their Facebook page.